LOWELL, MASS. 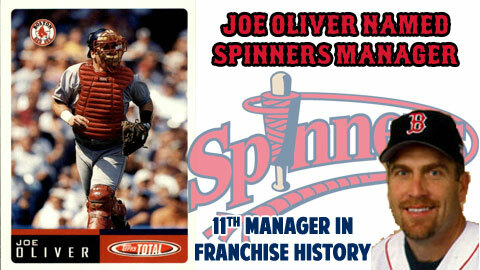 - The Lowell Spinners, Class-A affiliate of the World Series Champion Boston Red Sox, announced Joe Oliver as the 11th manager in franchise history Friday morning. A 12-year Major League veteran and World Series Champion, Oliver takes over for 2013 manager Bruce Crabbe, who joined the Pawtucket Red Sox in a coaching capacity and completes the coaching staff that was previously announced in December. "We are pleased to have someone with the extensive resume and career experience as Joe to lead our team," said Spinners President and General Manager Tim Bawmann. "We look forward to welcoming Joe to the Lowell community to continue the player development track that has helped lead the Red Sox to a World Series." Oliver played the bulk of his Major League career with the Cincinnati Reds, making his Major League Debut in 1989. He was a member of the 1990 World Series Champion Reds, delivering a game-winning hit in Game Two against Hall of Fame closer Dennis Eckersley. In addition to the Reds, Oliver also played with the Milwaukee Brewers (1995), Detroit Tigers (1998), Seattle Mariners (1998, 2000), Pittsburgh Pirates (1999) and New York Yankees (2001), before completing his big league career with the Boston Red Sox in 2001. "It's been an experience being away from the game, raising my family, but I promised my wife I'd step away and help after retirement," said Oliver. "I'm very excited and appreciative to return to the game and begin this chapter, especially with Lowell." Since retirement, Oliver has stayed involved in the game, coaching at the youth level as well as Bishop Moore Catholic High School in Orlando, Fla.
"I feel like I've been out of it long enough, but I've been involved [coaching AAU and high school]," said Oliver. "I'm excited to get back to the next level." Oliver completes the coaching staff, as it was announced in December that Noah Hall and Walter Miranda would be returning to their roles as Hitting Coach and Pitching Coach respectively. They will be joined by first-year Head Athletic Trainer Nick Faciana. The Spinners open the 2014 season at LeLacheur Park on Friday, June 13. Season Tickets and Mini Plans are on sale now at www.LowellSpinners.com, with individual tickets going on sale beginning Tuesday, March 18.